Ticketing No tiketing, free access. Popular Attraction MODENA? PAVAROTTI AND FERRARI! Every time Modena is mentioned thoughts turn instantly to the great Maestro and to Ferrari Race Team (la Rossa di Maranello- Maranello Red Car), always admired and desired. Modena and its province, however, are not limited to only this because in reality they conceal other treasures equally fascinating and worthy of getting to know, or rather, rediscovering. Modena, an island of treasure? Yes, we believe it truly is, and that's why we've created this site to open the doors of our land to you, welcoming you in the best of ways. Modena, Carpi, Sassuolo, Mirandola but also Vignola and its fortress, Nonantola with its medieval abbey, the various castles, the natural parks of Roccamalatina and of the high Appenine, the hot springs of Salvarola and the mud volcanoes of Nirano. Different itineraries for all tastes, not forgetting a generous culinary tradition that has always been appreciated throughout the world. Other useful information Situated at the center of the pianura padana region, Modena is a city easily reached from any location and by any means of transportation. The antique via Emilia has left space for the most comfortable and rapid highways such as the A1 and the A22 in the direction of Brennero. 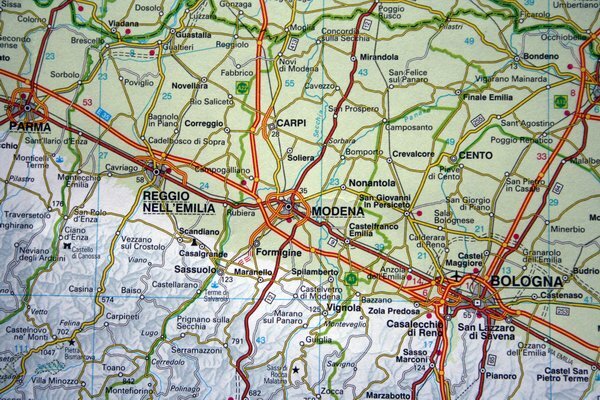 Between Modena and Miland there are approximately 170 km and from Rome around 400 km.